For some years now I've also kept a whistle among my keys. I don't know why really, as it's not a safety measure, but I think I was attracted to design and the story of pilots using the whistle during WW II as a survival whistle. 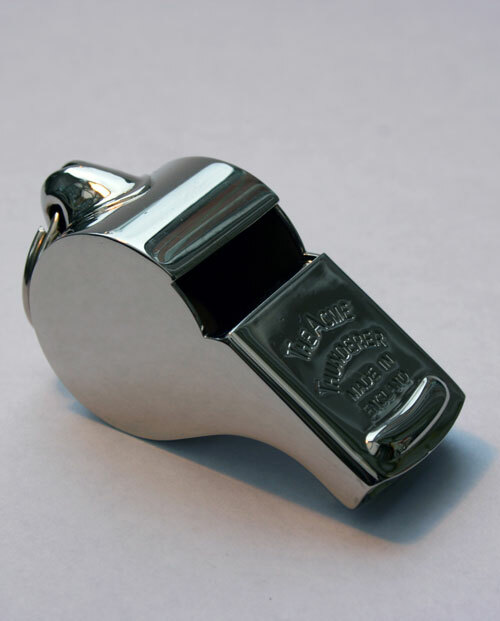 I don't know, if the story is true, but I do know one thing though; The Acme Thunderer is one hell of a whistle. The Acme Thunderer is the most iconic pea whistle ever made and it's still made in England (in Birmingham) by Acme Whistles. It's made of solid brass that has been nickel plated (which will look even better, once the plating starts to chip). There are a few different make ups in the Thunderer series and some of them are even made of plastic, still if you go for the classic no 58, you should be settled. In all honesty I've never found a genuine reason to use it which hasn't stopped me from enjoying carrying it around. But if you're a dog trainer, a referee, a pilot lost at sea, a policeman or if you frequently go to raves, I suggest you buy one straight away.